Before proceeding to explain the mechanics of Alternate Nostril Breathing it is important that we, from a yogic perspective understand the role that each nostril plays during the breathing process. Left Nostril Breathing: Relax – Left nostril breathing activates the Ida Nerve Ending in the left nostril, which relates to calmness and relaxation. Left nostril breathing is associated with the moon energy, which is changeable, feminine, yin, giving, and cool. Breathing through the left nostril for five minutes can calm you and lower your blood pressure. Right Nostril Breathing: Active – Right nostril breathing activates the Pingala Nerve Ending in the right nostril, which relates to alertness and activity. Right nostril breathing is associated with the sun energy, which is a constant, masculine, yang, and hot. Breathing through the right nostril for five minutes can energize yourself and raise your blood pressure. 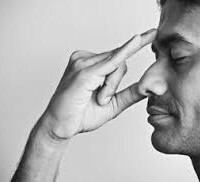 Alternative Nostril Breathing: Balance – Alternative Nostril Breathing creates a relaxed, harmonious feeling, as it balances the left and right hemispheres of the brain. Practice before bed or when tense. Sit in Easy Pose. Your left hand is in Gyan Mudra on your left knee. Close your eyes and focus at your 3rd Eye. Breathe relaxed, deep, and full, as you practice the following sequence, for 3-5 minutes. Yogi Tip – Throughout the day, we predominately breath through one or the other nostril. Your body regulates your energy and emotional states by switching your dominate nostril every 90 or 150 minutes. When you want to switch your energy, breath through the nostril of your choice.